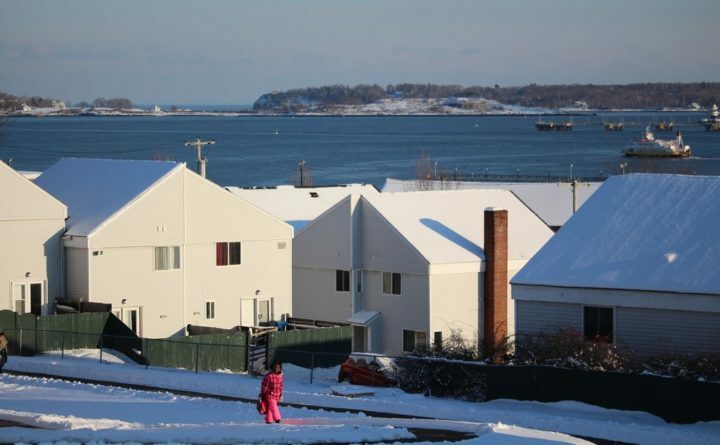 A young girl walks through the Munjoy South Townhouse Apartments property on Portland's desirable Munjoy Hill, overlooking Portland Harbor, Thursday, Jan. 18, 2018. PORTLAND, Maine — Three companies that own about 600 units of low-income and senior housing throughout Maine filed for bankruptcy late last year. They are linked to development mogul and convicted felon Michael Liberty and include the owner of a large affordable housing complex in one of Portland’s most desirable neighborhoods. The Chapter 11 cases are unlikely to affect tenants and will leave the companies stronger, according to their lawyer. But opposing counsel contends the cases don’t belong in bankruptcy court at all and are attempts to break contracts with the property manager. “Liberty controls all of those projects and he wants to sell the management rights that he’s already sold before,” said George Dilworth, a lawyer for Drummond Woodsum, which represents the properties’ manager, Stanford Management, LLC. The companies have applied to restructure under Chapter 11 of the federal bankruptcy law. In this sort of bankruptcy case, debtors usually submit a plan to reorganize their business and eventually pay back their creditors. Once dubbed “Donald Trump with a Maine accent” by Yankee Magazine, Liberty was recently released from a Federal Bureau of Prisons facility in Florida. He served a roughly four-month sentence for making illegal campaign contributions. Court filings name Liberty, 57, as a “general partner” in all three companies and list him as having the same address in Gray as the companies’ manager, Kevin McCarthy, though the developer is a resident of Florida. Liberty doesn’t play a role in the management of Pine State Housing, Series, LLC, lawyer George Marcus, told the Bangor Daily News in November. Marcus, who also represented Liberty in his criminal case last year, did not respond to more recent requests for comment. He is also the lawyer for Montfort Housing Limited Partnership and Birch Ridge Limited Partnership, the two other companies that have filed for bankruptcy. Earlier in January, the chief federal bankruptcy judge in Maine put the three companies’ cases on hold, ordering them to try to sort out an array of disagreements with their creditors in a settlement conference before the court weighs in. The disputes include the Maine State Housing Authority and the U.S. Department of Justice’s objections to state and federally regulated affordable housing companies using funds that partially come from taxpayers to pay lawyers fees in a bankruptcy case. “Anyone can appreciate how little sense it would make for a governmental entity to create and support a [housing] project to only to have project operating income used to harm its interests and the interests of the public,” Danile Felkel, a lawyer for the Maine State Housing Authority, wrote in a court filing. In Portland, Montfort Housing owns 140 apartments at the base of Munjoy Hill. It owes nearly $2.5 million to a list of creditors that includes Stanford Management, the Maine State Housing Authority, the Portland Water District and Liberty, according to court filings. Its assets are worth $6.7 million, the filings state. Earlier in January, several residents of the Munjoy South Townhouse Apartments said they were unaware that the owner had filed for bankruptcy. But city officials are keeping an eye on the case that affects one of Portland’s largest affordable housing developments. Birch Ridge owns the The Birches senior housing in Old Orchard Beach. The company has more than $6.6 million in assets and $135,000 in debt, according to court documents. Pine State Housing is a limited liability company composed of 17 other limited liability companies. It owns 435 units of housing at 17 different sites across Maine. The company has between $10 and $50 million in both assets and liabilities but less than $43,000 in unsecured debt, according to its Chapter 11 filings. “Hopefully, when the company emerges from Chapter 11 it will have a new manger and be financially sound,” Marcus said of Pine State Housing in November. Pine State’s largest unsecured debt is to Stanford Management. The housing company owes its manager about $14,000, according to a court document. A lawyer for Stanford claimed the bankruptcy cases are really aimed at resolving a contract dispute between the two companies. “These Chapter 11 cases do not serve any reorganizational purpose,” Jeremy Fischer of Drummond Woodsum said. Deborah Turcotte, a spokeswoman for Maine State Housing, declined to comment on the cases beyond saying that the affordable housing group will attend the settlement conference that she expects to occur in the next two months.